Have you visited the Writer's Workshop lately? It had been a while for me. As I've mentioned before, LitReactor is a pretty cosmopolitan place, as far as level of experience goes. While we have some real heavyweights hanging around, we also have people like me who, I admit, have not yet been published. And it's not that I've been getting rejected. I just haven't sent anything. It's an incredibly useful strategy to protect myself from failure, but it's a particularly poor strategy for actually succeeding. Now is the year to stop letting things mentally marinate. Stop tinkering. Stop fiddling. Stop procrastinating. Submit your work to our workshop, and get serious about this. When I get published, I will write about it here in the Spotlight. I'd love to see your name there as well. Memory is a good editor. It doesn't make sense to tear apart a first draft because the author is being overly descriptive. A quick note like "be sure to trim this down in next draft" will suffice. If it's nearing the end drafts and there are adverbs everywhere, it's time for some red ink. Have you checked out the LitReactor Book Club yet? Every month we start discussion on a new book, often by authors and publishers that have some affiliation with LitReactor. Discussion on Animal Money by Michael Cisco has already begun, so if you've read it, chime in. If you didn't make it this time around, don't worry; March's selection will be announced soon. Check it out! The Book Club is a great place to get to know our members and become involved in the community. LitReactor is a great place to sharpen your skills in the writing craft, but what many new writers find surprising is the complicated dance of administrivia involved in publication. Yes, there's contracts and rights and so forth, but what about the submission process itself? Naive writers are a vulnerable demographic targeted by scammers seeking to profit off the creative dreams of others, so arm yourself with knowledge on when, or if, it's ever appropriate to pay someone to consider your work for publication. We have some real been-there-done-thats in this thread, so it's well worth a read. It's hard for me to qualify exactly what makes this thread worth reading. It's certainly not uplifting. There's little in the way of real information, outside of what magazines are difficult to enter. My own theory is that it's refreshing for both new writers and seasoned writers alike to see how much failure even successful authors encounter; there is not a successful author alive who hasn't been rejected, and most writers, I would posit, are rejected more often than they are successful. Whatever your reasons, take a look and share your story with the rest of us. 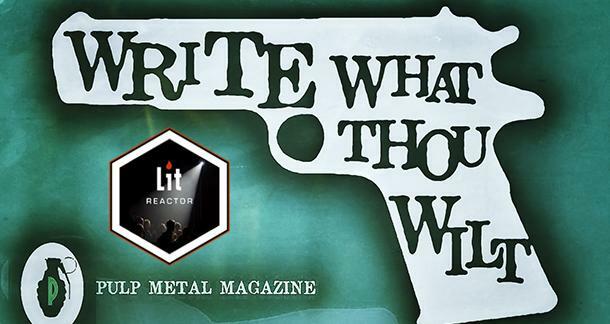 As yet another shining example of the quality of writer that LitReactor both attracts and produces, Matthew (who goes by the username Humboldt Lycanthrope) is a graduate from one of LitReactor's classes and instructed by Chuck Palahniuk. The story he wrote for that class found its home in Pulp Metal Magazine, and it's titled "A New Man." Lucky for you, it's available to read for free on the website. In addition, Matthew also placed one of his stories in Cultured Vultures. And yes, it's absolutely free to read online as well, because sometimes life just works out favorably. Check out "Tall Girl" and leave him your comments. Matthew Brockmeyer is a freelance writer and homesteader who lives in an off-grid cabin deep in the forest of Northern California with his wife and two children. He also writes extreme horror under the pseudonym Humboldt Lycanthrope. Hey guys, what I said at the top? I'm serious. If you've only published a couple of pieces, now's the time to publish more. If you have a thousand unfinished pieces waiting for some love, dust off the best one and send it to our Workshop. Stop calling yourself an aspiring writer, and become a writer. That's what I'll be doing, and I'm more than happy to share the Spotlight with you.